Chinese phone manufacturer Huawei have launched their eagerly awaited new smartphones, the P20 and P20 Pro, at the Grand Palais in Paris. The tech firm, who sold 153 million smartphones last year, have invested heavily in artificial intelligence and photography technology in a bid to challenge their smartphone rivals. The flagship P20 Pro contains a ground-breaking triple Leica camera designed to capture more light. It comprises of a 40-megapixel colour sensor and AI stabilisation technology to ensure smooth shots, even for amateur photographers. The AI technology can also recognise certain scenes and will adjust settings accordingly. The P20 series is Huawei’s most ambitious designs to date according to Richard Yu, the colourful Chief Executive Officer of Huawei Consumer Business Group. “We look for inspiration from artists to continuously evolve our approach to design and innovation,” he said to a large media gathering in the French capital. “The Huawei P20 Series builds on the legacy of our collaboration with Leica. With a breakthrough triple camera on the Huaweri P20 Pro, an advanced dual camera on the HUAWEI P20, and powerful artificial intelligence on both, today’s most vibrant consumers can capture and share the brilliance of the world around them,” he said. Huawei also announced a collaboration with actress, model and photographer Helena Christensen who used the phone to shoot her latest collection entitled ‘See More’. “Shooting with the HUAWEI P20 Pro smartphone not only made this process a lot easier, but it also meant I could get a lot closer to these amazing women, as it removed the need for any additional equipment, effectively breaking down the physical barriers that previously stood between me and my subjects,” she said. In terms of aesthetic, the P20 Pro has a classic design. The fingerprint sensor is placed under the display and it has slim, barely-there bezels. Much like the iPhone X, it contains a small notch at the top. Despite the large battery size it is only 7.88mm thick. Huawei also announced the release of a Porsche designed handset called the Mate RS, although it’s unlikely it will be available in Irish stores. 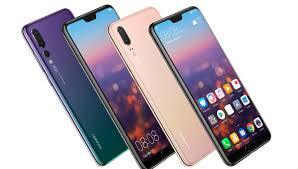 HUAWEI P20 and the Huawei P20 Pro will go on sale from 6th and 13th April respectively in Ireland. For full details and to check availability in your region, please visit http://consumer.huawei.com/ie/.